On the deck of a sportfishing boat on a sparkling Saturday morning in Mexico’s Gulf of California, Raymond Schinazi is singing. The name of the boat is No Big Deal. Few scientists who work in academia have benefited more from big deals than Schinazi. 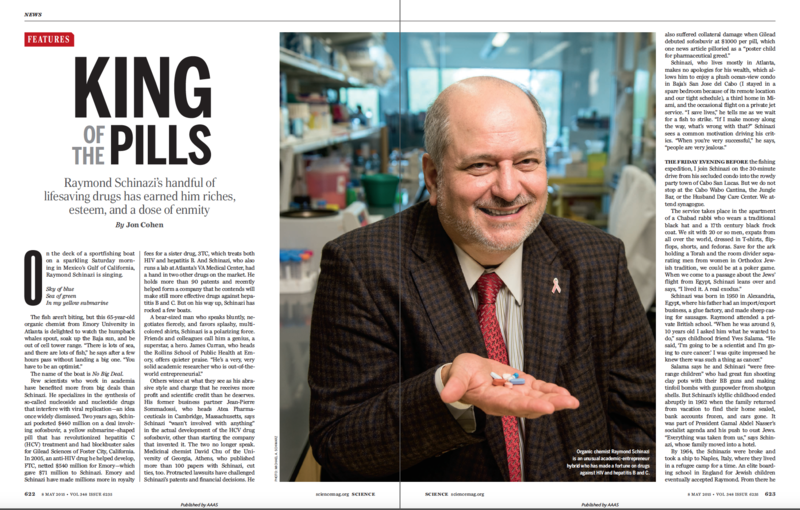 He specializes in the synthesis of so-called nucleoside and nucleotide drugs that interfere with viral replication—an idea once widely dismissed. Two years ago, Schinazi pocketed $440 million on a deal involving sofosbuvir, a yellow submarine–shaped pill that has revolutionized hepatitis C (HCV) treatment and had blockbuster sales for Gilead Sciences of Foster City, California. In 2005, an anti-HIV drug he helped develop, FTC, netted $540 million for Emory—which gave $71 million to Schinazi. 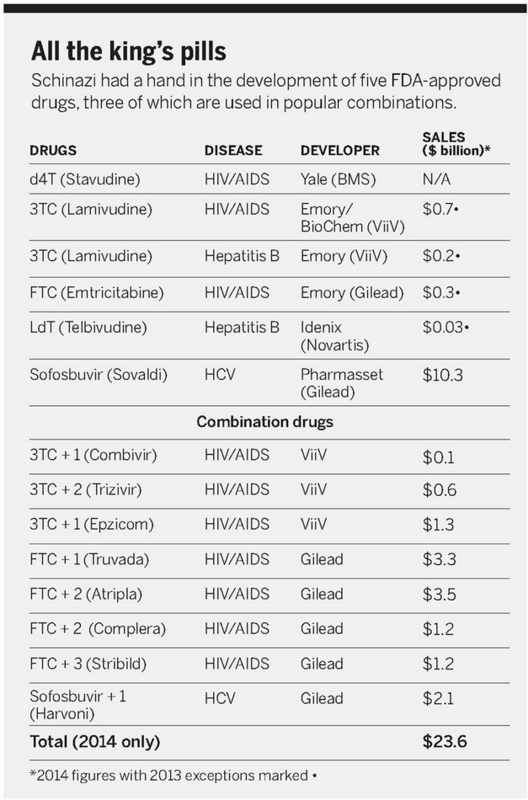 Emory and Schinazi have made millions more in royalty fees for a sister drug, 3TC, which treats both HIV and hepatitis B. And Schinazi, who also runs a lab at Atlanta’s VA Medical Center, had a hand in two other drugs on the market. He holds more than 90 patents and recently helped form a company that he contends will make still more effective drugs against hepatitis B and C. But on his way up, Schinazi has rocked a few boats. Organic chemist Raymond Schinazi is an unusual academic-entrepreneur hybrid who has made a fortune on drugs against HIV and hepatitis B and C.
THE FRIDAY EVENING BEFORE the fishing expedition, I join Schinazi on the 30-minute drive from his secluded condo into the rowdy party town of Cabo San Lucas. But we do not stop at the Cabo Wabo Cantina, the Jungle Bar, or the Husband Day Care Center. We attend synagogue. Salama says he and Schinazi “were free-range children” who had great fun shooting clay pots with their BB guns and making tinfoil bombs with gunpowder from shotgun shells. But Schinazi’s idyllic childhood ended abruptly in 1962 when the family returned from vacation to find their home sealed, bank accounts frozen, and cars gone. It was part of President Gamal Abdel Nasser’s socialist agenda and his push to oust Jews. “Everything was taken from us,” says Schinazi, whose family moved into a hotel. By 1964, the Schinazis were broke and took a ship to Naples, Italy, where they lived in a refugee camp for a time. An elite boarding school in England for Jewish children eventually accepted Raymond. From there he went to England’s University of Bath, where he completed an undergraduate degree and a Ph.D. in chemistry. He lived on 100 English pounds a month, working as a parking attendant to help pay his way, and didn’t have real money in his pocket until he won 3000 pounds in the Spanish lottery. While at Bath, Schinazi met his mother’s brother, pediatrician André Nahmias, who left Egypt before his nephew was born and had become a well-known herpesvirus researcher at Emory. Nahmias helped Schinazi secure a postdoc at Yale with William Prusoff, a chemist dubbed “the father of antiviral chemotherapy.” Prusoff synthesized the first antiviral used in clinical practice, a drug called idoxuridine that treats herpes infection of the eye. It is a synthetic nucleoside. Nucleosides are chemical precursors to the nucleotides that make up DNA and RNA. When viruses copy themselves, they string together nucleotides. Chemical modifications can create defective analogs of these building blocks. Viruses incorporate them into a growing chain of nucleotides but usually cannot add new links, gumming up production of genetic material and aborting viral replication. Nucleotide analogs typically make lousy drugs: The molecules are highly charged and have difficulty entering cells. Not so for nucleoside analogs, which cells convert into nucleotides. But they can cause serious toxicities if they get into human DNA or RNA. At the time Schinazi joined Prusoff’s lab in 1976, many drug developers shunned them. Schinazi fishes for big drugs, which are difficult to land. One morning, Schinazi gives the David Barry DART Achievement Award. He sings the praises of the deceased Barry, who once directed research at Wellcome and helped develop AZT, the first anti-HIV drug. He makes no mention of their complicated history. “David Barry was my arch enemy,” Schinazi tells me during a meeting break. In 1986, Schinazi—independent of Wellcome—synthesized AZT and gave it to Sommadossi, a pharmacologist then with the University of Alabama, Birmingham. Sommadossi proceeded to show that it had toxic effects on bone marrow cells. Barry, anxious about AZT’s imminent approval by the U.S. Food and Drug Administration (FDA), dismissed the results, Schinazi says, asserting that they were due to impurities in the compound he had made. “He was a big shot and I was a nothing,” Schinazi says. “He hated me.” The toxicity soon surfaced in human studies, but the FDA approved the drug nonetheless in March 1987. That same year, Schinazi helped Prusoff’s lab show that another nucleoside analog, d4T, had activity against HIV—and it later would come to market. But it was a third AIDS drug dubbed 3TC that elevated Schinazi to the big leagues. IN 1993, LARDER LED a Wellcome team that found a remarkable test-tube effect of 3TC and FTC: HIVs that mutated and became resistant to these drugs became more sensitive to AZT. The synergy meant lower, far less toxic doses of AZT, plus it gave 3TC and FTC a new reason for being. Novel combination therapies were in the offing. The next year, pharmaceutical giant Glaxo merged with Wellcome, leading Barry and a host of his colleagues to defect and form Triangle Pharmaceuticals. They joined forces with Schinazi, Liotta, and Chu, who had potential drugs on their university shelves. “[Barry] probably teamed up with Ray because his enemy became Glaxo,” Larder says. The unusual synergistic features of 3TC and FTC—and their obvious market potentials —led to a tangle of lawsuits, with Emory suing Glaxo and BioChem for patent infringement on 3TC, countersuits, and similar fights over FTC. The cases were all settled, transforming the fortunes of Schinazi and Liotta—and Emory. Triangle’s slow progress frustrated Schinazi, so he and Sommadossi formed two new drug companies in 1998 to focus on nucleoside analogs. “They weren’t taking any of our compounds, and I could see my technology sitting on a shelf,” Schinazi says. “I like speed.” Schinazi headed one, Pharmasset, while Sommadossi ran the other, Idenix. “Both companies made some great scientific discoveries when nucleosides were basically considered poor science,” Sommadossi says. Adding to his workload, Schinazi, Sommadossi, and a few other aggrieved researchers launched HIV DART that year because the main annual HIV/AIDS meeting in North America—the Conference on Retroviruses and Opportunistic Infections (CROI)—had repeatedly rejected many of their submissions. “We told the CROI people, ‘Next time, if you don’t accept our abstracts, we’re going to move our meeting to exactly the same date as CROI,’” Schinazi says. HIV DART made its debut in December 1998, in St. Thomas, the U.S. Virgin Islands, while CROI took place in the harsh winter of Chicago. “I know how to play hardball,” Schinazi says. TODAY, POPULAR ANTI-HIV drugs that have the brand names Combivir, Trizivir, Truvada, and Atripla all contain either 3TC or FTC. Add in d4T (its use is being phased out), and Emory estimates that some 94% of the people infected by HIV who have received treatment have taken one of the drugs Schinazi helped develop (see 648). These drugs made Schinazi rich, but the hepatitis drug sofosbuvir made him super rich. Sofosbuvir, a nucleotide analog (it masks the negative charge), must be taken in combination with another drug, but unlike older HCV treatments, it has no serious side effects, works against virtually all variations of the virus, and reduces the time to a cure from 48 to 12 weeks. Gilead bought Pharmasset for $11.4 billion to obtain sofosbuvir, which racked up more than $10 billion in sales last year, second only to one other drug on the market. But in the yin-yang of Schinazi’s life, this great success has brought him greater scrutiny than ever. First and foremost is sofosbuvir’s price tag of $1000 per pill. Gilead set the price, he notes, which he calls “obscene.” But at the same time, he blasts critics who suggest sofosbuvir’s price is not “reasonable” or “rational”—and that he profited too much. “Is it fair to pay $3 for a bottle of water?” he asks. “Do you complain when you’re thirsty? This is something that cures you from a disease.” And he notes that Gilead has already dropped the price because it now combines the drug with a new HCV drug it makes and sells for $1125 per pill. The company also offers a steep discount for poor countries and allows generic sales; indeed, according to Schinazi—“Look at the irony!”—he helped negotiate a price of about $11 per pill for his home country Egypt, which has the highest prevalence of HCV in the world. Schinazi claims he now has a spectacular HCV drug in the works. “We should be able to cure hepatitis C with just one drug,” he asserts. In November 2014, he merged his company RFS Pharma with Cocrystal Pharma, which he says also has strong leads on a hepatitis B cure and influenza drugs that work against all strains of the virus. He predicts Cocrystal will be as profitable as Pharmasset—and promises to give away his profits. “Everything I do now I’m giving to my charity,” says Schinazi, who has bankrolled land for a new synagogue in Cabo San Lucas, an exchange program with the University of Bath, and endowed chairs at Emory. Previous Post What is Jeopardy! ?